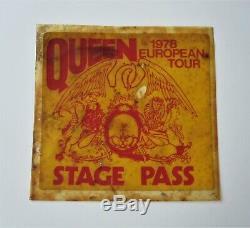 QUEEN - Original, vintage stage pass from Queen's 1978 European Tour (News Of The World era). 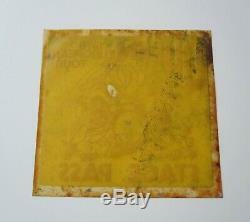 A superb piece of early concert memorabilia, made of plastic with red text and crest logo on a yellow background. Measures 12.3 cm x 11.8 cm (4.8 inches x 4.6 inches) approx. The condition is Acceptable due to marks and ageing. Wij leveren wereldwijd - Nous expédions dans le monde entire - Wir verschicken weltweit - Spediamo in tutto il mondo - Nós enviamos mundial - Vi skickar över hela världen. We sell rare and collectable Queen vinyl and associated memorabilia throughout the world. We aim to sell goods that are rare, collectable and in superb condition thus ensuring such items will appeal to the discerning fan, collector or dealer and continue to appreciate in value, in the future. We want you to be 100% satisfied, that is to say; the description and condition of your goods, our communication with you and how quickly you received your goods - hopefully you can then recommend us to others. We welcome, indeed, we encourage you to ask any specific questions you may have about any items listed for sale. We also accept Personal Cheques, Bankers Drafts and Postal Orders in Pounds Sterling only. Queen and related solo vinyl records, 7, 12, albums, LPs, CDs, CD singles and music memorabilia from all over the world including rare coloured vinyl, picture discs, shaped picture discs, uncut shaped picture discs, acetates, imports, new collectable, promo, vintage, withdrawn and deleted items. Also fan club, tour, concert and convention merchandise, programmes (programs), scarves, tickets, stubs, books, magazines and pretty much anything and everything Queen. As well as Queen we also rarities by Freddie Mercury, Larry Lurex, Roger Taylor, Brian May, John Deacon and The Cross. Such rarities include Bohemian Rhapsody Purple Vinyl, Blue Vinyl (Sleeve Only) and rare editions from France (French), Denmark (Danish), Turkey (Turkish) and Thailand plus Hammer To Fall (Live Sleeve) and many, many more.. 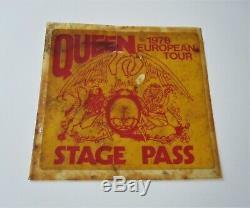 The item "QUEEN Original 1978 European Tour Stage Pass News Of The World Concert" is in sale since Friday, February 8, 2019. This item is in the category "Music\Music Memorabilia\Artists/ Groups\Queen".store" and is located in United Kingdom. This item can be shipped worldwide.